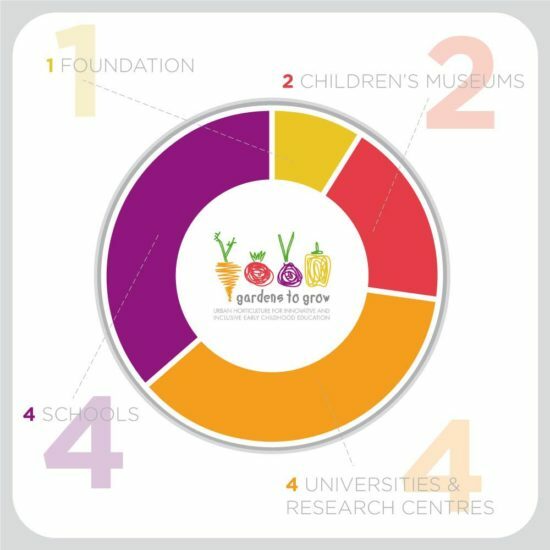 GARDENStoGROW is an initiative coordinated by Explora, the children’s museum of Rome. The partnership includes: 2 children’s museums, 1 foundation, 4 schools, 4 universities and research centres from Italy, Spain, Northern Ireland and Bulgaria. GARDENStoGROW Urban Horticulture for Innovative and Inclusive Early Childhood Education is a project co-funded by the Erasmus+ Programme of the European Union. The aim is to create educational and inclusive gardens and training courses for early childhood teachers and school managers and develop basic, civic and transversal skills for the 3-5 age group. The training event combined theory and practical elements. The program was mainly focused on two main topics: technical aspects regarding the set-up and maintenance of soil and extra-soil gardens and inclusive teaching approaches regarding gardening activities with small kids.